Ever since last year after Tour DAY Park City, when the massage therapist who was trying to help me get my muscles to the point I could actually walk again told me that I’d be faster if I actually stretched after exercise, I have tried to be reasonably diligent about stretching following rides. This is no problem at home. I can stretch anywhere I want, with the only risk being a kid (or wife) thinking that since I’m holding still it’s a good time to make some loving gesture that knocks me off balance (resulting in a muscle strain). But when I ride my bike to work, twisting myself into odd positions and holding them for half a minute is sure to further convince my co-workers that I am a freak. And it’s already bad enough that I occasionally walk into the office still wearing my cycling clothes. So where to stretch? I thought about hiding in the parking garage, and indeed was planning to go there today. Except that before I went I stopped in the bathroom. And accidentally discovered the most perfect place to stretch ever. 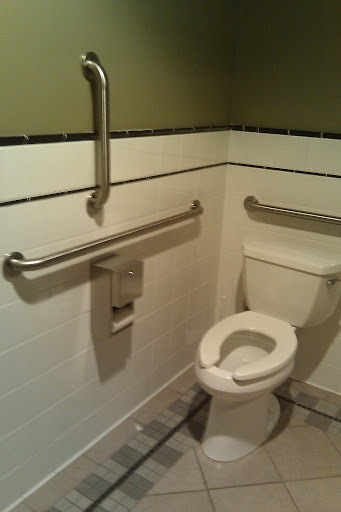 Privacy and hand rails galore—what more could you want? No. No. No. That is just wrong on so many levels. At least you don't have to worry about your clothing restricting your motion. "what more could you want?" Caution: while stretching in there, best to keep the moaning and groaning to a very minimal minimum. Don't want co-workers to get the wrong idea about which muscle you are stretching. 360, Psycho, dug: I should point out that I'm there first thing in the morning, usually before anyone else has arrived. The last people in the room were the cleaning crew overnight. The only smell is that of bathroom cleanser. Zeph: which is not to say there is no moaning. Do you know how many people have problems with their aim? I am going with gross. I have found a conference room where I close the blinds. Still weird just not bathroom floor weird. Blackdog: who lays down when they stretch? Only thing touching the floor is the soles of my shoes. I wouldn't even lay down on the floor of the conference room.